IPG's Media Lab is testing futuristic retail technologies. In an attempt to get out of the recession, market researchers and gurus are going the technical route. Being forced to try new things, keep shoppers interested and ready to spend money, retailers must stay on their toes and keep consumers on theirs as well. Marketing departments are trying interactive technologies to give shoppers a new experience in stores and boost sales. Many of the devices are futuristic, and even resemble the smart devices we carry in our pockets. One device even connects shoppers directly to a favorite social network. 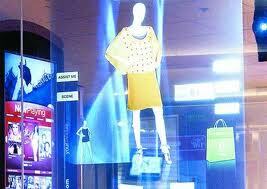 It's a mirror letting shoppers scan an item and project it onto her body before going to the dressing room. The mirror can be tapped to view different colors, find matching accessories, and send the image to their Facebook profile. With a surge in online shopping, because of its ease and speed, physical stores must find ways to stay in the game. "The role the store is playing is changing," says Mr. Ross, who was previously chief marketing officer at Home Depot. "Shoppers are walking up with a different set of expectations." Stores like Best Buy, J.C. Penney, and even Dunkin Donuts are putting big money into innovating the experience of their customers. It will be interesting to see how the shopping scene continues to change, and where we'll be in another couple years. I think the concept is not smart. I get going futuristic, but that goes a bit far. This concept comes from the sites that let you try new hair styles and colors based upon your face, you have to upload a head shot to try it. Consumers don’t have money, the glitz and glam of that "invention" won’t get them. Also, kids will break it. I think it’s a waste of revenue!